According to popular sentiment, it can be easier to move an entire airport rather than railroad tracks that run through or near it. But Fort Worth Alliance Airport (AFW) managed to move the tracks. And a state road as well. 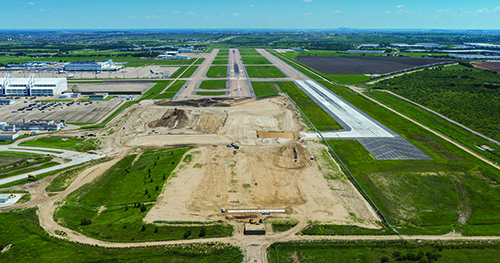 The complex relocations were part of a 25-year effort to extend the industrial airport's two 9,600-foot parallel runways to 11,000 feet each. The ultimate goal? Accommodating fully loaded transoceanic cargo flights all year long. Nearly everyone involved with the project agrees on one thing: It wasn't easy. "This project has literally been going on since 1992," says Airport Manager Christian Childs, C.M. "We are very happy to be finally looking at its completion. Alliance is an extremely dynamic airport in a very fast-growing area of the country. We want to see the airport and city of Fort Worth be successful, and the expansion will attract more and more users to the airport and to the city. " AFW President Tom Harris, who has been part of the lengthy project since Day One, agrees wholeheartedly: "The complexities involved in the planning and execution of this project have made it one of the most complicated airport improvement projects to ever be undertaken by our team or by the FAA. I could not be more proud of our airport team, as well as the dozens of engineering, construction and planning partners that have worked so hard to make this expansion a reality." Crews finished work on Runway 16R-34L in March; the second runway, 16L-34R, is slated for completion in early 2018. Total project cost was $275 million. AFW is the centerpiece of AllianceTexas, a master-planned community about 10 miles from downtown Fort Worth that includes commercial, industrial and residential elements. Developed by Hillwood, a Perot company, the 18,000-acre community is the brainchild of Ross Perot, Jr., chairman of The Perot Group. 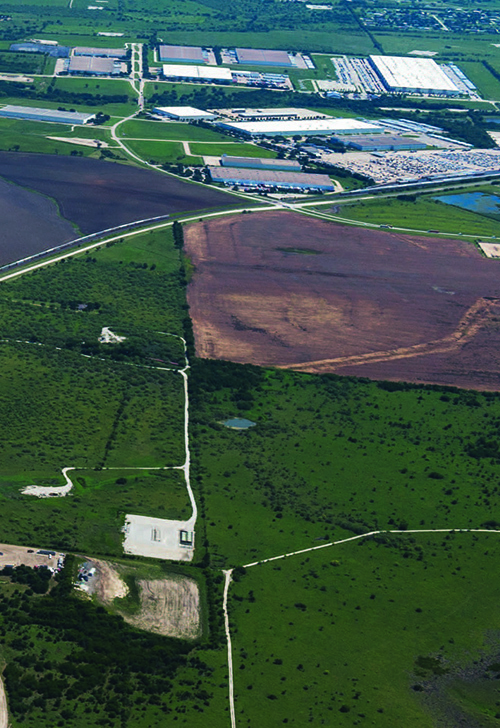 From a transportation perspective, AllianceTexas seemingly has it all: one of the nation's largest intermodal yards, two Class 1 rail lines, state and interstate highway connections and AFW-the world's first industrial airport. The community is also home to 440 businesses ranging from small local companies to Fortune 500 giants such as Amazon and Wal-Mart. Collectively, the businesses of AllianceTexas employ about 44,000 people. AFW was specifically designed as an industrial airport to serve the master-planned community. It is owned by the city of Fort Worth and operated by Alliance Air Services, a division of Hillwood, which also donated the airport land. While the bulk of AFW's 125,000 annual operations are cargo-related, it also accommodates corporate, general aviation and training flights. The primary tenant/user, however, is FedEx, which maintains its Southwestern Regional Sort Hub at AFW. The problem with the airport's original 9,600-foot runways was that fully loaded cargo aircraft had to sacrifice either fuel or payload to generate enough lift when taking off for transoceanic destinations during the hot summer months. Although seasonal, the airfield limitations eventually made AFW less attractive to cargo operators. Childs explains that funding limitations and operational forecasts prompted developers to include 9,600-foot runways when the airport was originally designed. Soon after the airport opened in 1989, however, they proved inadequate. "The short runway length in the really hot months of the year wasn't working," he relates. "We needed that additional runway length to accommodate our current users, as well as increasing our marketability to future customers." By the early 1990s, discussions began in earnest about extending the runways to 11,000 feet. Protected wetlands to the south ruled out extension in that direction. The only option was to go north-right through a state road and railroad tracks operated by Burlington Northern Santa Fe. "Those two pieces of infrastructure were in the path of the runway extension," recalls Jeff Toner, managing principal for Jacobs Engineering Group, which served as program manager for the project. "They had to be moved before we could begin." Everyone involved knew that site preparations would be expensive, time-consuming and require a great deal of cooperation. In total, the project ultimately affected 64 landowners. Early in the planning stages it also became clear that FAA Airport Improvement Program grants would be limited, and the team settled in for a slow-moving project. Preliminary field work started in 2003, and by mid-decade, crews were cleared to move the state road 4.5 miles northwest of the airport to prepare for the runway extension. Both the original and new highways remained open between 2007 and 2015. The old road was severed and closed two years ago when crews began runway construction. About the same time, engineers devised plans to relocate and reroute the railroad tracks. "We had to acquire the right of way, relocate utilities and construct 12 miles of new rail line to offset the three miles of rail line we severed," Childs notes. The long process included public hearings and noise studies. "It was very difficult," Childs recalls. "But Burlington Northern Santa Fe is a fantastic company-they had a long-standing relationship with our parent company, Hillwood; so that helped. In fact, AllianceTexas wouldn't be where it is today without BNSF." The expensive rail line relocation was paid for with grant money from the North Central Texas Council of Governments (COG), a regional planning organization. "As you can imagine, the FAA isn't too interested in building railroads," Childs remarks. "But COG realized the value of the runway extension and the logistical advantage it would bring to the Alliance area and the entire region-not just for AFW or the city of Fort Worth." Toner credits the financial support of the regional planning council for facilitating the runway extensions. "The rail relocation was a big piece of the project," says Toner, who has worked on the project since 2000. "Once we received that grant, we could actually begin moving forward." Airfield contractors wasted no time after site prep crews finished relocating the rail line in September 2015. "We literally went to work the next week on the runways," Childs recalls. First up was Runway 16R-34L, which was completed in March 2017. In addition to extending the pavement, the airport also added an RNAV GPS instrument approach. Previously, pilots landing on 16R-34L were restricted to visual operations. "For us, it is a huge deal to have two parallel runways, each with at least one type of instrument approach," Childs comments. Construction on Runway 16L-34R began in November 2016 and included a short-term closure this summer for configuration and lighting updates. It is scheduled to reopen in fall at 9,600 feet; then close again for extension work to continue from the north. "We will reopen with the enhanced approach capability for the Category 3 ILS to allow FedEx to do their holiday rush," Childs notes. "And then, immediately after the Christmas holidays, we will close the runway for 30 days to tie all new infrastructure into the existing, and restripe it as a new 11,000-foot runway." Airport officials expect to reopen Runway 16L-34R in February 2018. At that point, AFW will be able to offer users two 11,000-foot runways with instrument landing systems. 4 million cubic yards of dirt and embankment material was imported to the project site. To secure enough fill, prime contractor Lane Construction purchased 100 acres of property in a nearby town to use as a borrow pit and purchased additional material from a resident who owned the land next door. An estimated 1.2 million cubic yards of material was imported for the runway work alone. "And that had to be brought in, placed and compacted in about 18 months," notes Childs. In late August, trucks had already made nearly 80,000 trips from the excavating area to the airport. Due to the large amount of fill needed, engineers were especially vigilant about compaction issues. "We were concerned with potential settlement of new embankment and underlying material to new embankment," explains Jacobs Senior Project Manager Tex Schmidt. "We paid a lot of attention to that during the design process with our geotechnical engineers and completed weekly progress reviews." In late August, geotechnical engineers from Terracon detected only 2 inches of settlement in areas where crews had placed up to 40 feet of embankment material. "We're quite happy with the small amount of settlement we had, and we have a good level of confidence that this embankment is not going to move a whole lot over time," reports Schmidt. Despite several extra site prep issues, key team members cite staggered funding as the project's biggest hurdle. "The majority of challenges were associated with phasing, because full funding was not available at the beginning of the project," explains Brad Fox, project manager at Lane. "The project had to be built in a less-than-ideal sequence, which led to design and coordination issues. This was exacerbated by extremely wet weather, which had a substantial impact on the embankment schedule." Fox credits Jacobs and AFW for working with airport users and the FAA to find solutions that allowed the project to proceed with minimal impact on airfield operations. "From the beginning, the challenge was getting enough funding in place to do all the work," agrees Jacobs' Toner. "That's why the project took the time it did-we never had enough funding in place to do all of it." Due to the long duration, most of the personnel who began the project weren't around for its end. And in at least one instance, a company involved in the project completely closed its doors. "There's not a whole lot you can do when people change jobs and firms are acquired," remarks Toner. "Those kinds of things happen and you just have to be flexible." The few people who were in place for the duration experienced a unique construction project. 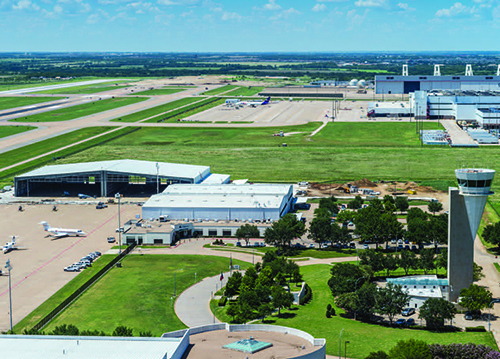 "For two decades, Fort Worth Alliance Airport has worked closely with several partners...on the intricate plans necessary to reroute rail lines and roadways to accommodate the expansion of our runways," reflects AFW's Harris. "It has been a privilege to be part of this project from the very beginning to watch, day-to-day, how it's come together."